The world of the artisans of Mezcal is a fascinating one. Most people have heard of Tequila of course. Both Tequila and Mezcal are an agave based liquor. 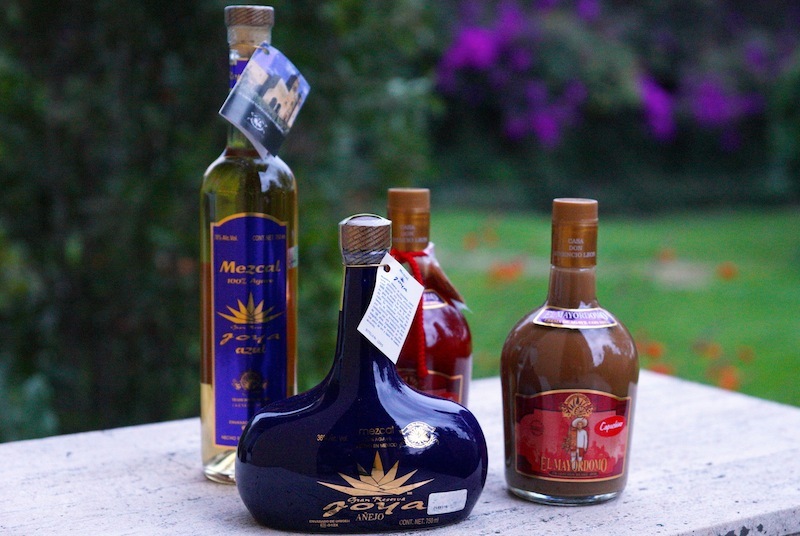 The differences are that Tequilla by law can only be made with one variety of Agave, the blue Agave. Mezcal on the other hand can be made with 30 different varieties of Agave (including blue Agave). Another difference between the two is the methods of production which creates a distinct flavor and bouquet in both drinks. For both drinks it all starts with the plant, the Agave. It takes 5 to 8 years for a plant to be ready to be cut and used for production. The leaves are then cut off and the “pina” or heart of the plant is kept. This is how they look like after the leaves are removed. When it is ready the pulp is ground under a heavy stone wheel pulled by a horse or donkey. 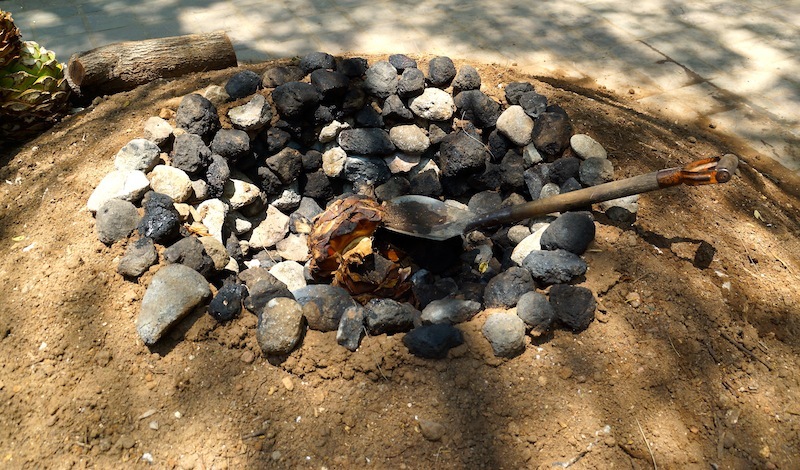 This baking process gives Mezcal its distinctive smoky flavour. Then you add the pulp to hot water to initiate the fermentation that will take 6 to 10 days. Once fermented they put the mixture into copper containers like the one you see on the right over direct fire. The vapor generated is then captured by the copper spiral you see on the left that is immersed in cold water. 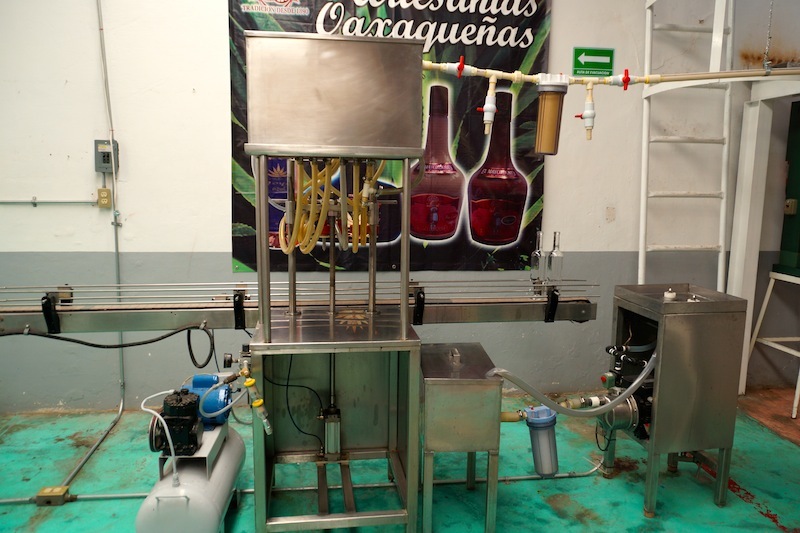 This permits the distillation to take place and to obtain a pure Mezcal with the right balance between alcohol and sugar levels. Tequila and Mezcal are also made in different regions of Mexico. Tequila productions covers the states of Jalisco, Michoacan, Guanajuato, Nayarit and Tamaulipas. You can find Mezcal being produced in Oaxaca, Durango, Guanajuato, Guerrero, San Luis Potosi, Tamaulipas, Zacatecas, and Michoacan. Oaxaca is the center of the production since 80 to 90% of the Mescal is produced there. What you may also not know is that Tequila in certain middle to upper class families was always a social drink. The women of the house would often have a small glass of Tequila as an aperitif. It was always well regarded when socializing. Some of my Mexican friends who drink tequila as an aperitif told me their grandmothers also did. It’s a family tradition. Mezcal was for a long time the poor cousin of Tequila but things have started to change and Mezcal is now becoming more popular. It is now in fashion and the drink to have when you go to a high end bar in Mexico City. Its price has also increased substantially. 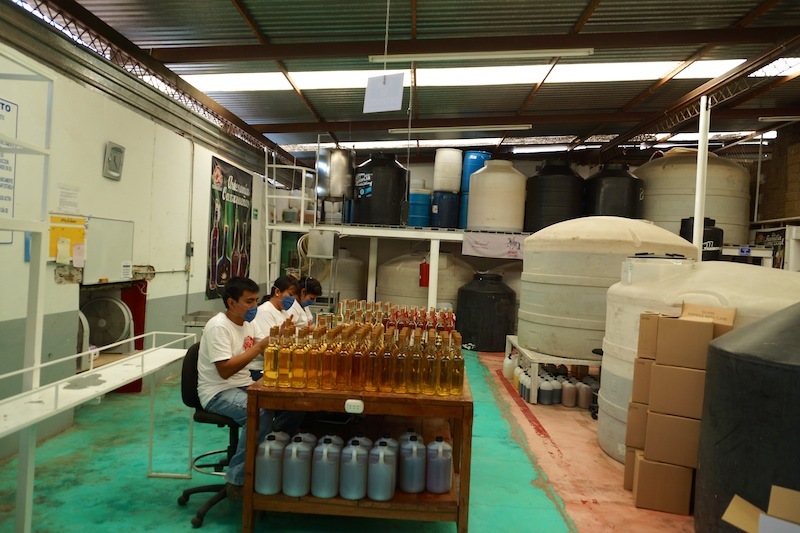 The quality of the Mezcal has also improved significantly in recent years. Although it is still for the most part an artisanal craft, there has been an increase of the care put in its production. 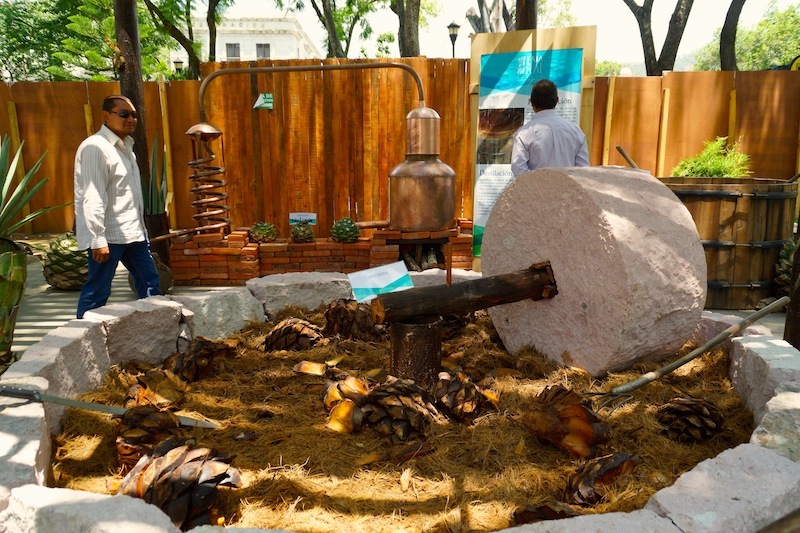 Mezcal producers have been competing in spirits competitions where they have won international recognition. New flavours have also been created like the creams line with flavors like walnuts, cappuccino, or certain fruits. 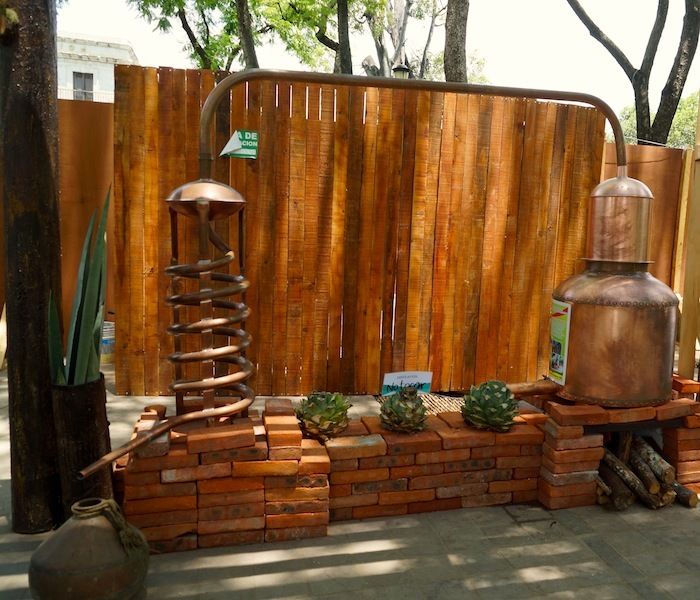 When you visit Oaxaca, going to visit a Mezcal producer is usually included in the program. There are certain places that are already geared for foreign or Mexican tourists but this time, I was looking for something different. Chance had it, that the International Fair of Mezcal was taking place when we were visiting. This was the perfect opportunity to meet local producers, taste their products and try to find out a bit more about their business. 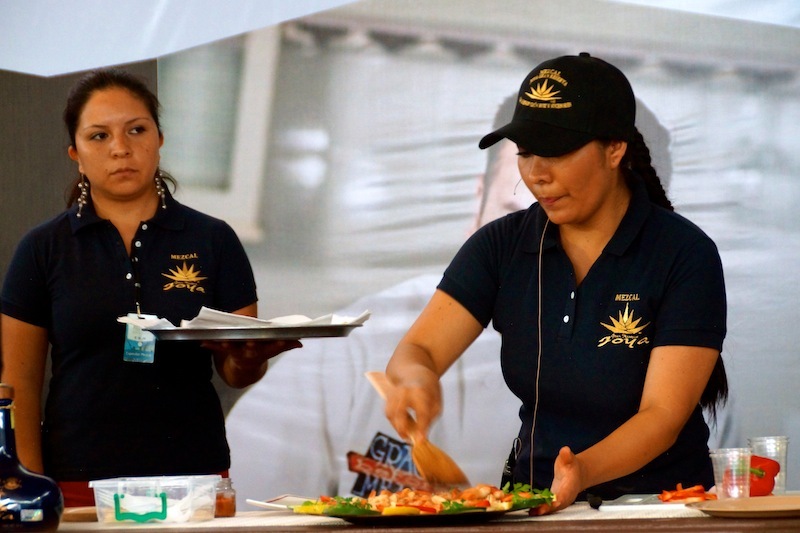 There were also conferences, presentations and cooking classes with Mezcal that caught my attention. I decided to sign up for a cooking class given by the Leon Ruiz family, a family that has been in the Mezcal business for 5 generations since the great grandfather of the actual owner created the Joya brand in 1890. The cooking class was given by his wife Rosario and she cooked a delicious shrimp recipe made with two different Mezcals from the family production. The passion the owner Carlos Leon and his wife put in the presentation was infectious and I decided to try and get an appointment to visit their factory. Although it was a last minute decision, we were welcomed by the family and had a very interesting tour of their production facilities in the beautiful pueblo of Tlacolula in the state of Oaxaca. 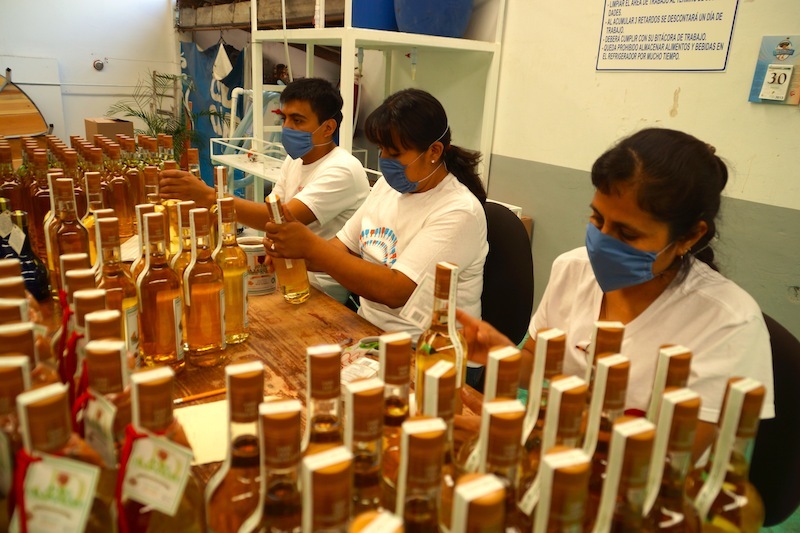 Their factory is located in their home and it was amazing to see how the whole family collaborates and works on the production and even the bottling of the final product. The two sons of Mr. Carlos Leon are already following in his father’s footsteps and are ensuring the future and survival of the Joya brand. 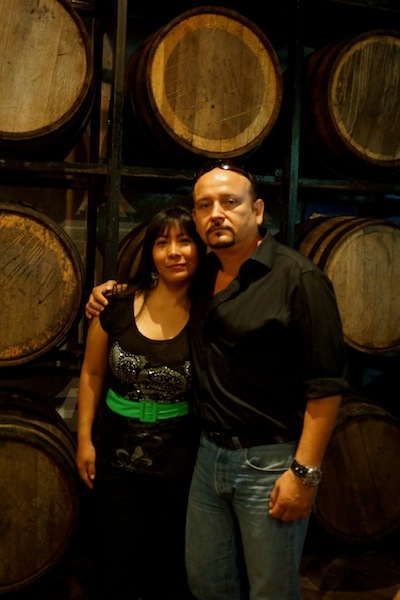 We started by looking at the oak casks where the Mezcal is put to mature. 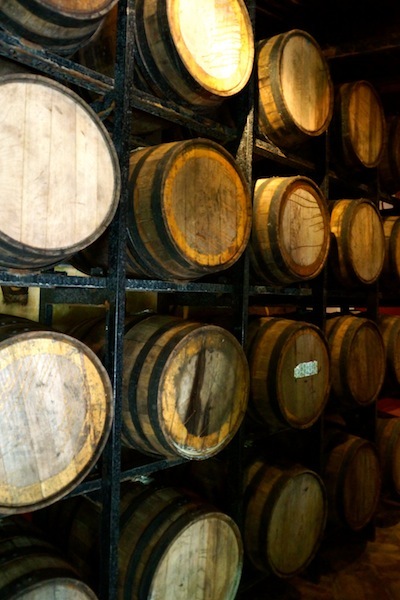 These oak casks are bought from Canada and were used before to age whiskey and brandy. When they arrive they have to go through certain preparations to get them ready to receive the Mezcal. 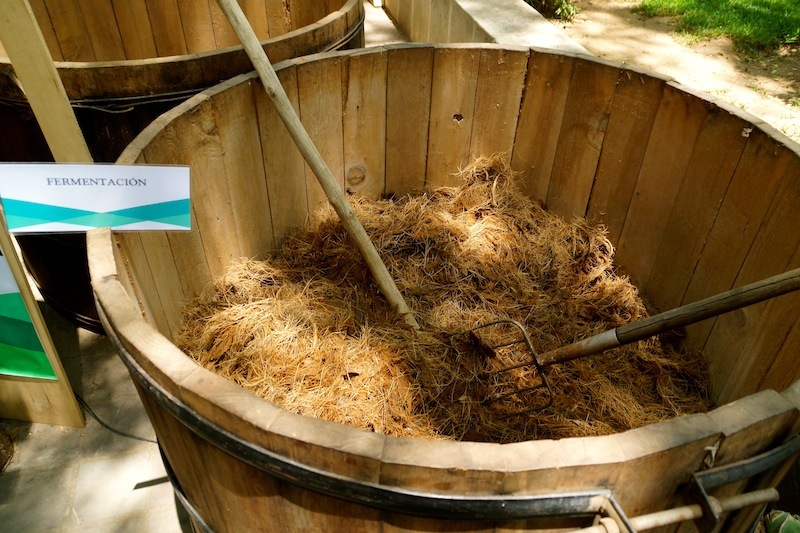 The family uses a mixture of herbs and honey to coat the casks. They usually use three layers to have them ready for the Mezcal. Their Grand Reserve, that has an aging period of 10 years in the oak casks and of which only 10.000 liters /2.6 gallons produced per year, has a very special bouquet. It won the gold medal in the New York Spirits International Competition in 2011. Next we visited the factory and saw the bottling machinery. As the owner explained, the bottling process is surprisingly simple. Right now the tanks where they keep the different types of Mezcal store enough product for three months. 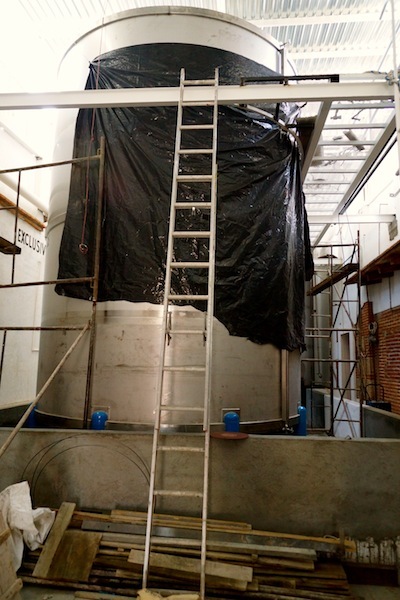 However, bigger tanks are being built by the Leon family to store Mezcal for at least one year and a half. This need came from the fact that Tequila producers are coming from Jalisco to buy the hearts of the Agaves in Oaxaca as it is cheaper here. 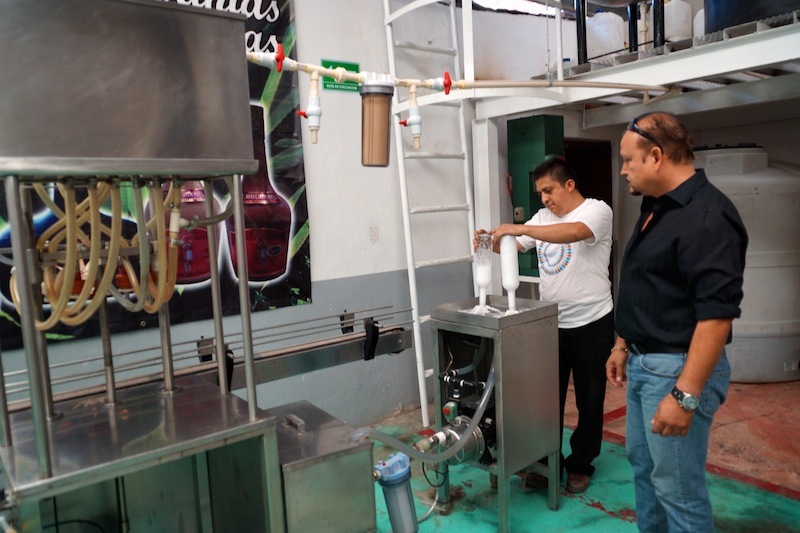 This decreases the availability of the plant for the Mezcal producers forcing some of them to build bigger tanks so that they can weather out agave price fluctuations. After the tour we sat with the family, met the new generation and were offered a taste of their best Mezcals. 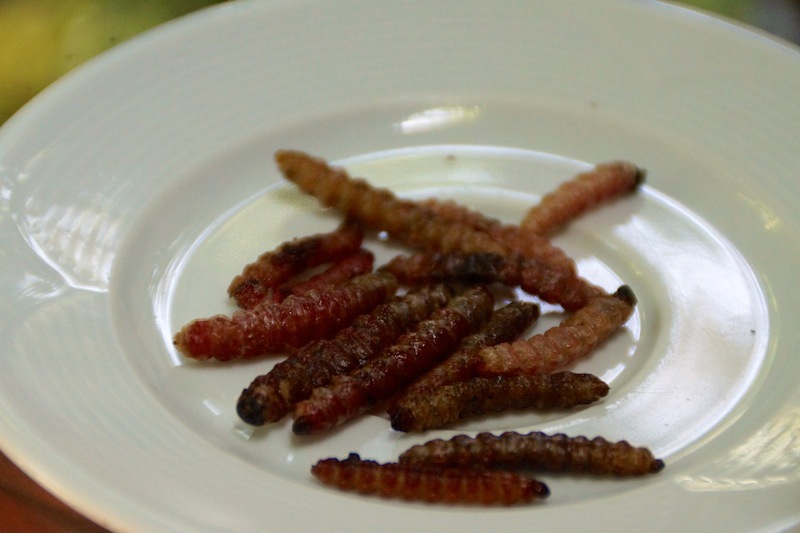 To accompany it, we were offered the famous fried gusanos or worms from the Agave plant. The wife of the owner, Rosario Xochitl is a great cook. She created a line of salts with different ingredients like these gusanos or worms in powder and dried chiles that she exports exclusively to the United States. 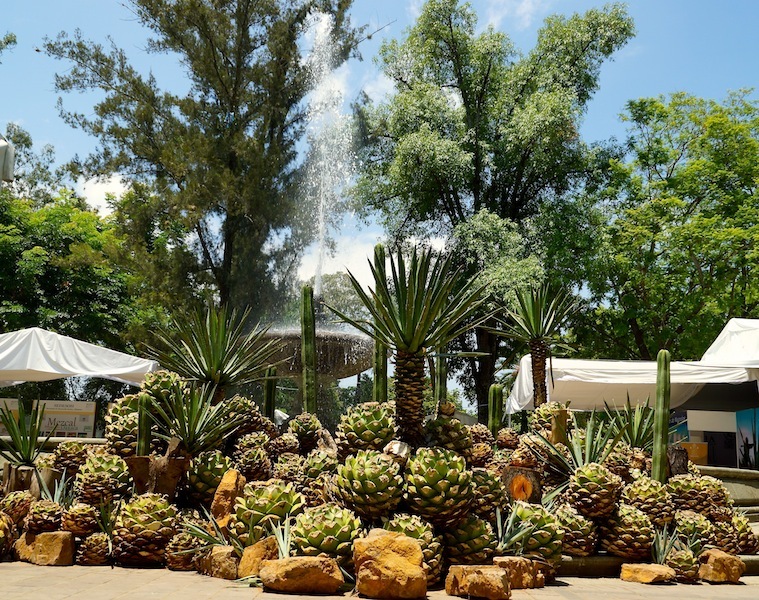 If you want to know more about the artisans of Mezcal I advise you to travel to Oaxaca and visit artisanal Mezcal producers like the Casa Ausencio Leon Ruiz and let yourself be introduced to a fascinating world of Mexican spirits.